Andrea is a AFAA certified Group Fitness Instructor with additional specialty licenses to teach R.I.P.P.E.D. and ZBox Fitness. She has not always been a fitness “buff." Her love of being fit and healthy has evolved over the years. After raising four children with her husband of over 30 years, she decided it was time to focus on her health and well-being. 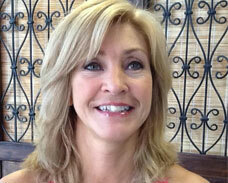 She truly enjoys teaching and sharing her energy and enthusiasm with the many wonderful people she meets in classes. She believes it is never too late to start embracing a healthy lifestyle and makes her classes very welcoming and non-intimidating. In addition to teaching fitness, she enjoys her job as a preschool teacher.